Put simply, this page collects 3D models of Roman imperial figures so that students can gain skills in identifying them. It is part of a sequence and readers are encouraged to begin on the coin identification page. The portraits shown below come from the following institutions or collections: Capitoline Museum, Corinth Museum, Getty Villa, Metropolitan Museum of Art, an Art Institute of Chicago via Anonymous Loan from Private Collector, North Carolina Museum of Art, Vatican Museums, and Yale University Art Gallery. The 3D models are generated from personal photographs and images from wikipedia/flickr or were dowloaded from public internet sources. 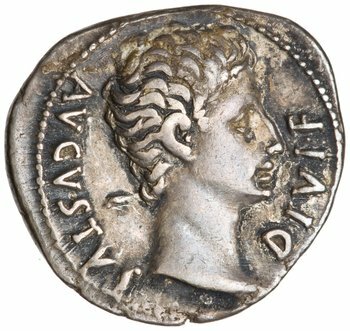 The above [click through] model of a portrait now on display in the Getty Villa, and images of a coin, now in the collection of the American Numismatic Society, both show an image of Augustus, the first Roman Emperor. Click on the model and rotate it to view Augustus in profile. That emphasizes the similarity of the small numismatic portrait and the larger sculptural representation. Also note that the coin identifies its subject. 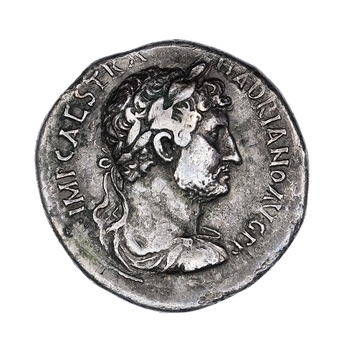 Specialists use such "self-identifying" Roman coins to identify portraits. Follow this same procedure for the unidentified portraits below. One hint before you start, none of the portraits shown below are also of Augustus. That would be too easy. Identify 5 of the following coins using the search tools at acsearch.info and the American Numismatic Society (ANS). You can also refer to the exhibition catalog "Faces of Power," which is available as a downloadble PDF. Don't be boring by identifying just the first five coins, instead choose a selection that interests you. This page is part of a sequence on identifying Roman imperial portraits. After completing the "coin identification" exercise, you can use these coins to help you identify the portraits on this page. Punk Archaeology is a irreverent and relevant movement in archaeology, and these papers provide a comprehensive anti-manifesto. This project is supervised by Phoebe Acheson of the blog (Becoming a) Classics Librarian and Chuck Jones, the Tombros Librarian for Classics and Humanities at Penn State University and the blog AWOL - The Ancient World Online. Controlled Vocabulary and Subject Headings may become useful as the project grows. At the page linked I have begun to collect resources that may be useful in guiding the development of these. Sample New Page To see what that looks like, click on "edit" for this page and look at the wiki markup. Go to that new page and start adding content! Use annotations. They add scholarly value! Include links to WorldCat records for books, and include links to reviews, especially open-access ones (BMCR, AJA, etc.). Include DOI links for articles, if possible, or other stable urls. Arrange the bibliography using sections, for ease of navigation. Consult the Wikipedia Cheatsheet for a quick resource. Abstract: Increasingly powerful computational methods are important for humanists not simply because they make it possible to ask new research questions but especially because computation makes it both possible -- and arguably essential -- to transform the relationship between humanities research and society, opening up a range of possibilities for student contributions and citizen science. To illustrate this point, this paper looks at the transformative work conducted by the Homer Multitext Project (http://homermultitext.blogspot.de/; http://www.homermultitext.org/). 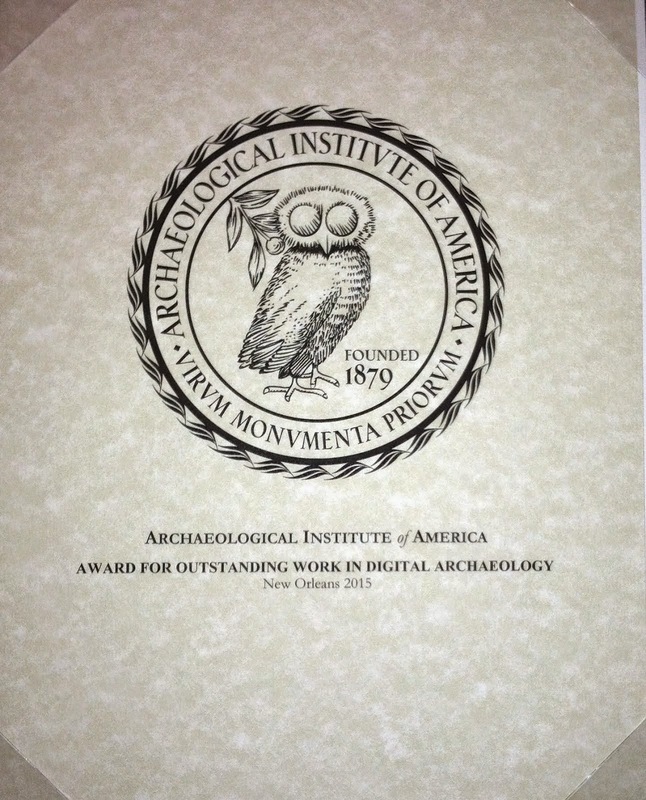 As of today, Internet Archaeology is an open access journal. We've concluded our hybrid phase and will no longer charge a subscription for access to any of our past and future content. Several things have spurred this decision. Over the last 4 years, we have made active efforts in this direction, by switching to a default CC-BY license, by opening up our back issues with an annual rolling wall, and by adjusting our subscription charges accordingly. During this time, we have also witnessed a marked increase in quality, funded submissions, including several themed issues. Internet Archaeology has always tried to be more than 'just a journal'. We explore the possibilities of the web and have delved into many different publication formats. This flexibility extends into everything we do. Being a small operation has meant we could be responsive to changes in the wider scholarly landscape, and the journal has simply reached the tipping point. Funded through JISC's eLib programme, Internet Archaeology was launched in 1995 as a born-digital journal and published its first issue in 1996. It was also open access before the term was really invented. As part of the initial funding agreement, and as the only sustainable option for us at that time, we introduced institutional subscriptions in 2000, followed by subscriptions for individuals in 2001. By 2010, the open access debate had truly sparked into life and it was around that time that we started to publish open access content where funds were available. By the start of 2014 however, over 50% of the articles we had published were open access, so we have decided to make open access the focus of our efforts from now on. There will always be challenges of course but I'm very excited to be taking the journal into this new phase. (1051 followers). You can also follow AWOL on Google+. The Archives Directory for the History of Collecting is a pioneering resource created to help researchers locate primary source material about American art collectors, dealers, agents and advisors, and the repositories that hold these records. The database is a work in progress that is regularly updated with information contributed by both institutions and individuals. For more information about the directory, contact Samantha Deutch, Research and Program Manager for the Center for the History of Collecting. For other news and related activities visit the Center for the History of Collecting. The Center for the History of Collecting gratefully acknowledges Melvin R Seiden, the Billy Rose Foundation, Townsend I. Burden, Peter Blanchard, DeCourcy E. McIntosh, Juan Sabater, and an anonymous donor for their generous support of this project. After a decade-long hiatus in the years of World War II, archaeological fieldwork was resumed in Iran in 1948. In that year, the Oriental Institute returned to its long tradition of archaeological research by sending Donald McCown to the lowlands of southwestern Iran to conduct a series of surface surveys to find a multi-period site for excavation. For his survey, McCown chose the Ram Hormuz region, southeast of lowland Susiana and the region south and east of the provincial town of Ahvaz down to the Persian Gulf. McCown recorded 118 sites in the Ram Hormuz and Ahvaz areas and eventually chose for excavation the large prehistoric mound complex Tall-e Geser. Three months of excavation in 1948 and 1949 yielded materials that were kept in Chicago for many years. Apart from short articles, the site was never fully published. In Part 1 of this two-part volume, Abbas Alizadeh and colleagues have undertaken a final publication of the site. This task was undertaken because of a number of important considerations. First, the excavations at Geser have been cited as justifying the division of the Uruk period in southwestern Iran into Early, Middle, and Late phases. Second, Geser remains the only systematically excavated site in the Ram Hormuz region — a strategic location between the Susiana and Mesopotamian alluvium and the Zagros highlands of southwestern Iran. Third, Geser has produced a very extensive body of archaeological materials dating to the comparatively less understood proto-Elamite period, roughly the first few centuries of the third millennium bc. And finally, with the exception of a 700-800-year gap following the proto-Elamite phase, Geser remains one of the only sites in the Near East to have a very long and generally uninterrupted depositional sequence, in this case spanning from the fifth millennium BC to the Safavid period. The site’s crucial location, its importance in the archaeological literature, and its long stratigraphic sequence made it imperative that the original excavation results from Geser be published in anticipation of a time when the site can be re-excavated. Part 2 of this volume presents the results of regional surveys conducted in the Ram Hormuz plain from 2005 to 2008, which were undertaken by Alizadeh and colleagues with the goal of understanding the semi-nomadic, mobile component of lowland Susiana and its hinterlands through time. Thus, a national, all-encompassing, and comprehensive approach is required to do essential researches on the Iranian architectural history in such a systematic method that consider certain parameters like the great number of works; the variety of Iranian nature, climate, and culture as well as the impact of this variety on the country’s architecture; and the historical continuity of this architecture. Inevitably, performing this task calls for the use of information technology facilities. Based on the said approach, a vast knowledge-base covering the Iranian architectural history since the seventh millennium B.C. up to the present has been established that in addition to arranging the existing data and knowledge, will organize the production of related information. It will also affect both national and international researches regarding the Iranian architecture and cause the contemporary architectural data to preserve and record. Obviously, encyclopaedias are the results of various human knowledge accumulated due to research activities. In this way, a conventional encyclopaedia is a tool to provide its readers, including the public and scholars, with a set of previous research compiled under a specific category called “entry” that could be handed over to expert scholars to write articles on them. In comparison with conventional encyclopaedia Iranshahr is compiled based on a new concept of an encyclopaedia, that is to say all its addresses are considered as potential authors of future articles on every entry of it that may make their contribution to the very encyclopaedia or to any other medium. In other words, Iranshahr is not a place for presenting articles, but a database to provide the users with the existing knowledge on its available entries and guide them to get access to the archives of books, articles, and documents. The ISAW Library publishes lists of its recent acquisitions throughout the academic year. Please see the links below for bibliographic information of our new holdings by month, available in static HTML and a Zotero library. In questa pagina sono pubblicati testi di particolare interesse scientifico. Lo scaricamento dei documenti è gratuito. E' consigliabile scaricare i testi con il procedimento: click destro sul link e scegliere "Salva destinazione con nome..." o "Salva oggetto con nome...". PSI Laur. Inv. 22013: Retorica o romanzo? Chronique de Jean, évêque de Nikiou. Texte éthiopien.